Wedderburn, who was just a lonely man and did not have any interests in anything, wanted to have an experience of life. He had not had anything dangerous or terrible things happened to his life so far. His life was just totally flat. One morning, he told his housekeeper who was also his own remote cousin; that he felt that there would be something happening on that day, and this sign came true. It started when he decided to go to London to see what plants Peters had, then came back home with Vandas, Dendrobe, and some Palaeonophis. From that day on, he became very interested in growing orchids as he did not have anything to do at home. Although his housekeeper kept offending the appearance of his plants and wanted him to throw them away, he did not make up his mind even a little. He was too headstrong and too passionate to grow orchids inside his little hothouse. The Vandas and Dendrobes withered under his care, but the Palaeonophis showed a sign of life. Wedderburn was very excited to know this. He took care of the growing orchids very carefully to fulfill his own expectation which, with or without his awareness, was too get an adventure. Living his life all alone only with a companion of his housekeeper, Wedderburn wanted to have something happened to his life. Something that could last in his mind and other’s for months, years, even forever. He was too curious to experience troubles. He never felt in love, never got married, and never got any accidents. He told his housekeeper about the people he knew and their horrible experiences which he called exciting. What an interesting life, he thought. Then one day, when he brought orchids to house, he could feel it that he would get an adventure from those strange plants. He was determined himself to grow them –it was probably the first time he got interested in something that fast­– although his housekeeper did not support his idea. He was not influenced by the cynical comments toward his lovely orchids. In contrast, Wedderburn’s housekeeper was really disgusted by the shape and the appearance of the Palaenophis orchids. Although Wedderburn loved the orchids so much, she did not feel the same. She was a fainthearted woman that she always got scared of little things. She often got over-worried about Wedderburn, too. Her conflict against herself is that when she tried to fight her dislike toward the orchids but cannot bear it finally. After a while of Wedderburn’s growing orchids, a very fast growth showed by the Palaeonophis, the trailing green spikes of it bore now three great splashes of blossom spreading insufferable scent. Wedderburn got in the hothouse and was stunned to see this; then felt very excited. The blossom swam before his eyes and suddenly the bricks on the floor were dancing up and down. Then the white blossoms, the green leaves behind them, the whole green house, seemed to sweep sideways, and then in a curve upward. It seemed that there would be a strange chaotic inside the little hothouse. Wedderburn did not come for his evening tea which was his custom. It made his housekeeper think that he must have his watch stopped and guess he was still dealing with the orchids. She decided to go to the hothouse, and to her surprise, she saw Wedderburn lied at the foot of the strange orchid. Wedderburn was fainted. The orchid grew very momentous and the tentacle-like aerial rootlets no longer swayed freely in the air, but were crowded together, a tangle of grey ropes, and stretched tight, with their ends closely applied to his chin and neck and hands. This chaos inside the little hothouse made the housekeeper confused. She could not believe everything she saw at the moment, while Wedderburn was lying fainted at the foot of the monster plant. She tried to pull her cousin from leech-like suckers but she could not, the giant plant was too strong and sturdy. The blossom scent almost made her fainted, it was too stingy. She opened the nearest door and tried to breathe in fresh air, and suddenly she got a brilliant idea. The housekeeper came back to the hothouse with a renewed power. She just got an idea which she thought must be work out. Before coming in, she managed to catch up a flower-pot and smash in the windows at the end of the greenhouse. 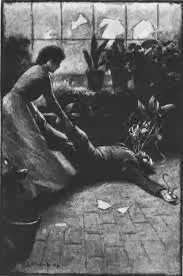 Then she tugged now at Wedderburn's motionless body, and brought the strange orchid crashing to the floor. It still clung with the grimmest tenacity to its victim. In a frenzy, she lugged it and him into the open air. Another idea crossed her mind; tearing through the sucker rootlets one by one, and finally she could release and dreagg Wedderburn outside. He was white and bleeding from a dozen circular patches. While the housekeeper’s struggle to save Wedderburn, the odd-job man came up to the hothouse and amazed by the smashing of glass, and saw her emerge, hauling the inanimate body with red-stained hands. The housekeeper told him to bring a glass of water, and tell Annie to come out there to her, and then go for Dr. Haddon at once. He went for the order with curiosity and amazement on his face. Wedderburn finally opened his eyes and totally conscious, after a few times he opened his eyes and closed them again. He was puzzled about what happened to him, and his housekeeper told him that he was fainted in the hothouse. However, he had not suffered a great injury. He was given brandy mixed with some pink extract of meat, and carried upstairs to bed. After that, Dr. Haddon stood in front of the giant strange orchid which the color was now dark brown. Most of the torn aerial rootlets lay already withered amidst a number of dark stains upon the bricks. The stem of the inflorescence was broken by the fall of the plant, and the flowers were growing limp and brown at the edges of the petals. One of the aerial rootlets still stirred feebly. The blossom scent almost disappeared, though the condition inside the hothouse was still in a messy. The strange orchid still laid there in the next morning. Its color is black now and it became putrescent. All of this disaster in the hothouse did not make Wedderburn sad or suffer, he was bright and garrulous upstairs in the glory of his strange adventure he just got for the first time. This short story used third-person-omniscient as the point of view. The author referred to each character in the third person. He called him with the main character with his name which was Wedderburn, and also called the other characters with their own names. The protagonist character in this story was Winter Wedderburn, a quiet, rather dull man whose passion was to grow orchids. By reading the paragraph above, the author served the details of Wedderburn accurately. In, addition, the dialogues between Wedderburn and his housekeeper revealed a lot about each character’s background, education, and motivations –especially Wedderburn’s. “Nothing ever does happen to me," he remarked presently, beginning to think aloud. "I wonder why? Things enough happen to other people. There is Harvey. Only the other week, on Monday he picked up sixpence, on Wednesday his chicks all had the staggers, on Friday his cousin came home from Australia, and on Saturday he broke his ankle. What a whirl of excitement - compared to me."